Well I'm sure most of you have heard about my accident or should I say incident in the water. Wednesday at about 3:00PM I was swimming and boogie-boarding with my mom and cousins in the Atlantic ocean in Holden Beach North Carolina. We were up to our waist/chest in water so it wasn't too deep. All of a sudden I felt something grab me and then chomp down on my left foot a 2nd time. It happened so fast!! All I thought was "What? Those were teeth! run away, get everyone away!" I just kicked at it and screamed to my mom and cousin that something bit me. We got up to the beach where the sand was still wet but not in water and I laid down on a boogie board to get my foot up in the air. By that time someone had gotten a beach towel and a few people had come to see what happened and help out. One lady (Molly) was a huge help in getting everyone organized and keeping me safe. They had someone call 911 and others go get ice and clean towels. The were putting pressure on my foot through the towel. All this time I was just laying there and all i could do was pray over and over, thanking Jesus that I was ok, I had people helping me, and that He was with me. I wasn't too panicky at that point and was "with it" and able to know what was going on. 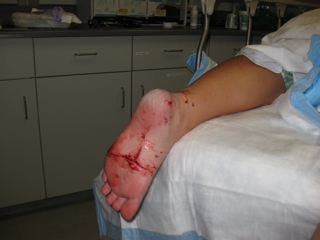 I didn't know the extent of my injuries because all I had seen was a quick glance down at the laceration on my ankle when walking in. Eventually a volunteer fire fighter came and had gloves and gauze. They were able to stop the bleeding pretty quickly (thanks to my dehydration:) haha)) and so then Molly and others helping could then really assess my wounds and wrap them up after having gloves. During this time the tide was starting to come in so they needed to move me further up the beach, so a bunch of men and Molly, her friend, and my aunt carried me a long ways up the beach to where the paramedics were going to be bringing a chair and stretcher. I think I said thank you to all of them helping me while I was up on the boogie board---that couldn't have been easy carrying dead weight through sand uphill!!! They were carrying me on the chair up a short set of stairs and then down another set to get to the parking lot that the ambulance was in. I had never been in an ambulance before, nor had an IV or anything like that! It was all very surreal that this was happening. In the ambulance they hooked me up to the heart monitoring machine, oxygen, and an IV of fluids. Then I arrived at the hospital and they were all so excited to see it. 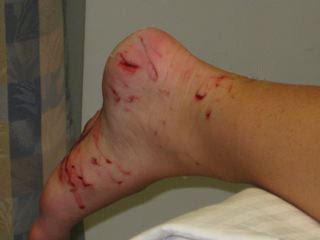 The nurses had to wash out my cuts but I hadn't had any pain meds yet, so it hurt really bad just washing with water. I was sweating by the time they were initially done with that. Then after that they had me sit there for a while. During that time, at least 10 people came in to see my bites. I didn't care so they came in, I told the story and they looked at the wounds. Everyone was so excited to see a real shark bite. They all seemed really surprised I was so relaxed and calm about it all--That I wasn't upset. 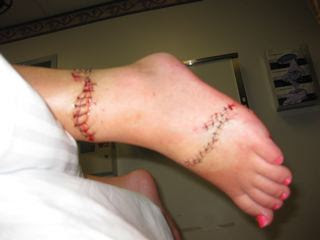 After that they came to take x-rays for my foot and ankle. I was left alone for about 3-4 minutes after that and I just started thanking the Lord again that I could wiggle my toes and ankle some, that there were people to help me and that I was ok. Finally the main doctor Dr. Bill Sherrod came in to start rinsing out my wounds and getting ready to stitch them up. He had me flex my foot to see how mobile I was. I could see the inside of my ankle and see the tendon itself moving!! crazy huh? It was like my left foot was detached from myself, so it was kind of cool. He thought maybe it was a little torn, but he's not an orthopedic doctor so he wanted another opinion. We stopped by McDonalds on the way home, but before we went too far I felt nauseous and had to stop on the side of the road quickly. We got home around 11 and it felt good to sit down. People were already finding my name on websites like www.sharkattacksurvivors.com and other news stations. I was amazed that it was already that fast spread! Turns out it was probably a 5-6 foot shark! but I never saw it which will help with not having such bad dreams i think. The shark bit me 2 times, a quick one and then the big chomp. 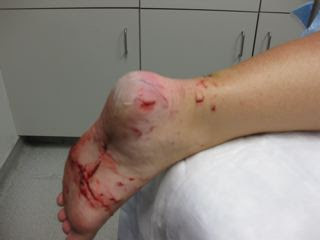 If you look at the picture below of my whole foot/ankle after it was stitched you can see the width of his jaw. The ankle mark and the marks on top of my foot are the to sides of his mouth/teeth. He bit me from the side so his lower teeth hit my heel and bottom of my foot. 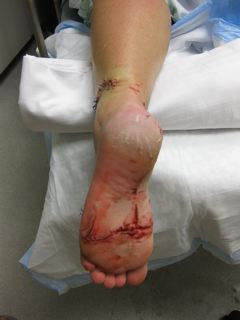 Here are some pictures---sorry if they are too gruesome. On Thursday morning we had to go see the orthopedic surgeon to see what his opinion was about my mobility and the tendon issue. He looked at my stitches and said they looked good. He tested my sensation on the bottom of my foot and moved my toes. He had me move my ankle in all directions and move my toes as much as possible. He said I was very lucky and should have no problem recovering as long as I dont get an infection. With 42 stitches an infection could happen, so I just have to be careful and keep it clean and dry. He didn't see any reason why I couldn't go to Mexico as planned, so that made me feel better too, because I am still excited although I know this is changing my plans some in terms of mobility. Hopefully I can be in a walking type cast in not too long and be stronger and better on crutches than I am now. It is exhausting just going to the bathroom! :) I took my first shower Thursday night and i thought I would fall down so many times. I was really tired and my foot hurt by the time I was finished. I am already dreading taking another one! So please keep me in your prayers--that I will be infection free, heal quickly, and that whatever happens with Mexico I will find contentment in that. I am so overwhelmed with gratitude to the Lord that no nerves or tendons were severed in that area where so many are present, that no others were hurt, and that He has protected me so greatly. Oh my goodness Julia. Yes, your mom told the the story but reading from your perspective really helps me get a good picture of everything. I am so thankful for God's protection for you. You are such a light for Him...He sent His angels to protect you. What a testimony you will have now! I mean seriously, how many people can say they have been attacked by a shark? 1 in 8 million if I remember what your mom said she was told. Mind staggering. Please know the entire Holeman clan is praying hard for you. We love you so much! I'm glad to know you have a blog so I can read it all the time. :) If you haven't, check out Hunter's at http:/www.hunter-holeman.blogspot.com. I say that because the two of you seem to have so many of the same faith feelings. He has blogged some pretty deep blogs while on his summer mission project this summer. I think you would enjoy reading them. By the way, I called him to tell him everything and he said the prayer ministry team (which is the team he is on) will pray for you too! Heaven is being flooded with requests for healing and quick recovery. Hang in there. Love you. this freaks me out. i hope your recovery goes well. Holy cow, Julia! You are the only person I know who's ever been attacked by a shark! I'm really glad you are okay!!! Hope your recovery is quick! Oh Julia! My mom called me right away and we have been praying for you ever since. Praise God it was not worse. We are praying for a speedy recovery and no infection! Love you!